Helps keep the student healthy! Helps the student participate in keeping others healthy! The final course in the first year of Step 2 Study & Life Skills , ages 7-8, and for students of any age who are developing literacy. All about the systems in the body, the illnesses that can strike a body and how to care for them, and ways to keep one's self healthy. 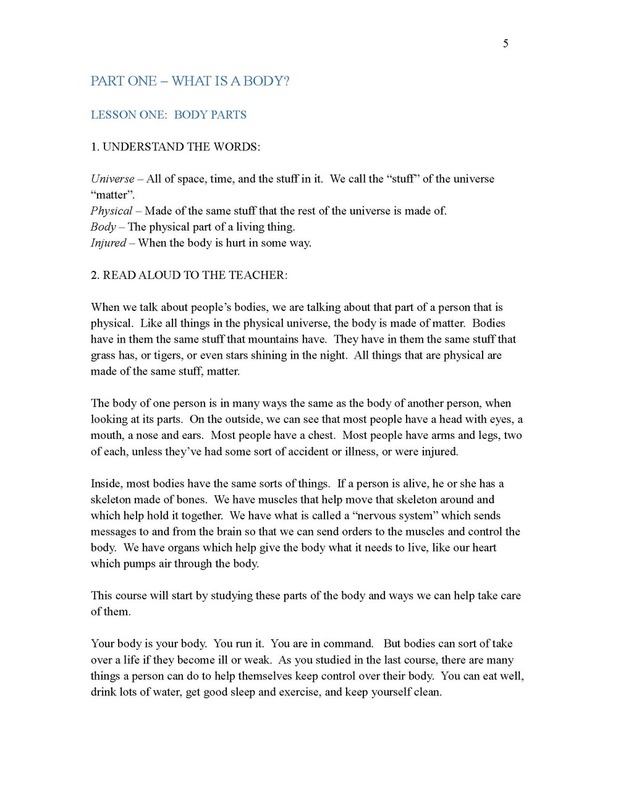 A must course to follow up Elementary LYL 3, and for any student who needs to understand how the body works. Cancer, diabetes, MS, MD, the common cold — a host of ills are investigated as the student comes to better understand the body and how it works. 18 lessons, 9-10 weeks of study. What a body is and a simple idea of how one is supposed to work. Skin problems like acne - causes, problems and possible solutions. Skeletal problems, injuries and illnesses. What nerves and a nervous system are. Problems and illnessess involving organs. Teeth, eyes, ears, noses and throats - illnesses and how to help with them. Doctors, medicines and natural cures such as diet or holistic approaches. When one should go to a doctor or hospital. The Patient's Bill of Rights. What to do to help when someone gets sick. The common cold, the flu. Multiple Sclerosis, Diabetes and Muscular Dystrophy. Drugs and alcohol and their effect on the body.